Glow in the dark road markings have been unveiled on a 500m stretch of highway in the Netherlands. The paint contains a "photo-luminising" powder that charges up in the daytime and slowly releases a green glow at night, doing away with the need for streetlights. 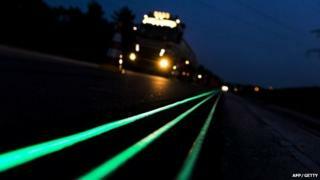 It is the first time "glowing lines" technology has been piloted on the road and can be seen on the N329 in Oss, approximately 100km south east of Amsterdam. Speaking to the BBC last year about his plans Mr Roosegaarde said: "The government is shutting down streetlights at night to save money, energy is becoming much more important than we could have imagined 50 years ago. This road is about safety and envisaging a more self-sustainable and more interactive world." Mr Roosegaarde's projects aim to help people and technology to interact. His past projects have included a dance floor with built-in disco lights powered by dancers' foot movements, and a dress that becomes see-through when the wearer is aroused. "I was completely amazed that we somehow spend billions on the design and R&D of cars but somehow the roads - which actually determine the way our landscape looks - are completely immune to that process," Mr Roosegaarde said. Heijmans was already working on projects involving energy-neutral streetlights when Mr Roosegaarde teamed up with the company. "I thought that was updating an old idea, and I forced them to look at movies of jellyfish. How does a jellyfish give light? It has no solar panel, it has no energy bill. "And then we went back to the drawing board and came up with these paints which charge up in the daytime and give light at night," he said. Heijmans says that the glow in the dark technology is also "a sustainable alternative to places where no conventional lighting is present". Innovation on roads needs to be encouraged said Professor Pete Thomas, from Loughborough University's Transport Safety Research Centre but new technologies need to prove themselves. "We have some high visibility markings already on roads in the UK, plus cats-eye technology etc. So the question is how much better than these is this alternative? "If we put this technology on all unlit roads that would be a lot of kilometres and it would be a big investment so if safety improvement is the target then we need hard evidence about how this compares to what we already have and to back up any safety claims," he said. The UK Highways Agency said it was watching the trial in the Netherlands with interest but said that previous studies had shown that "luminescent road paint would be unsuitable for use in this country".